The state might need to help some farmers move away from Kilauea volcano so they can escape the effects of vog and stay in business, the chairman of a special legislative committee on volcanic smog said yesterday. Kilauea continues to spew nearly 3 thousands tons of ash and deadly sulfur dioxide gas every day. The state helped Hilo farmers move to safer ground after the 1946 and 1960 tsunamis, said Rep. Bob Herkes. Something similar should be considered now even though the idea may first shock some farmers, he said. "Maybe we need to take a good hard look at providing other farmland somewhere so they can move and stay in business," said Herkes (D, Volcano-Kainaliu). "At some point, we need to be able to move farmers to another area." Herkes spoke to reporters after the House Special Committee on Vog Effects held its last meeting before it prepares a report it will submit to House Speaker Calvin Say (D, St. Louis Heights-Wilhelmina Rise). 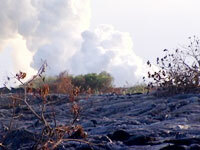 Big Islanders have long lived with vog, which is formed when sulfur dioxide from Kilauea mixes with sunlight and dust particles. But the volume of vog in the air above many communities has jumped dramatically since March, when Kilauea started emitting more than double the amount of sulfur dioxide it had been spewing before. Protea and other flower crops have been particularly vulnerable to the effects of vog, with some farms losing all their plants. Flower farms downwind of Halemaumau Crater - including those in Ocean View, Pahala and Wood Valley - have been hit especially hard. The financial loss for farmers is in the hundreds of thousands of dollars.